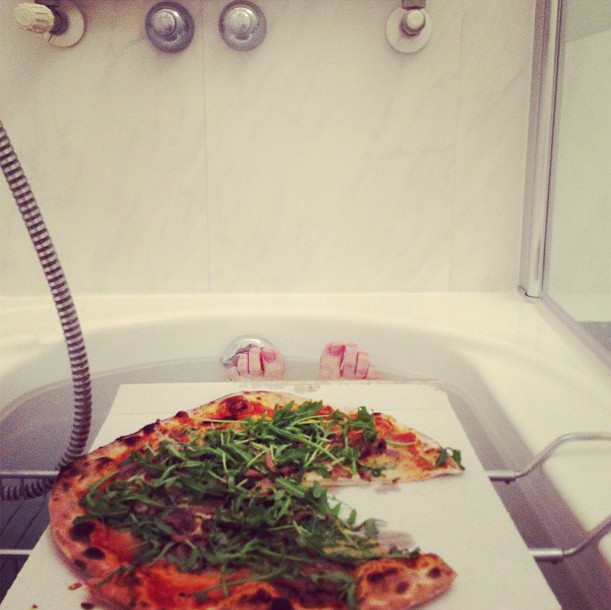 Ok, I admit it I had my very first pizza bath and I would do it again if I had a bathtub at home. I had a long day traveling from Sestriere to Verona and was hungry. Why not multitask by getting clean while having dinner? The mushroom and arugula pizza was delivered to my suite. I slipped in the bath and had a fantastic meal. Thanks to Instagram I got to capture this awesome moment. What type of pizza bath would you take? Haha, please do and report back! It is so relaxing. Well deserved after a long day. Haha, it may be more fun in Ohio!! The only shame is that I’ve never taken a pizza bath before! I need to get on that!! Maybe an empanada bath for you, I would love that! !